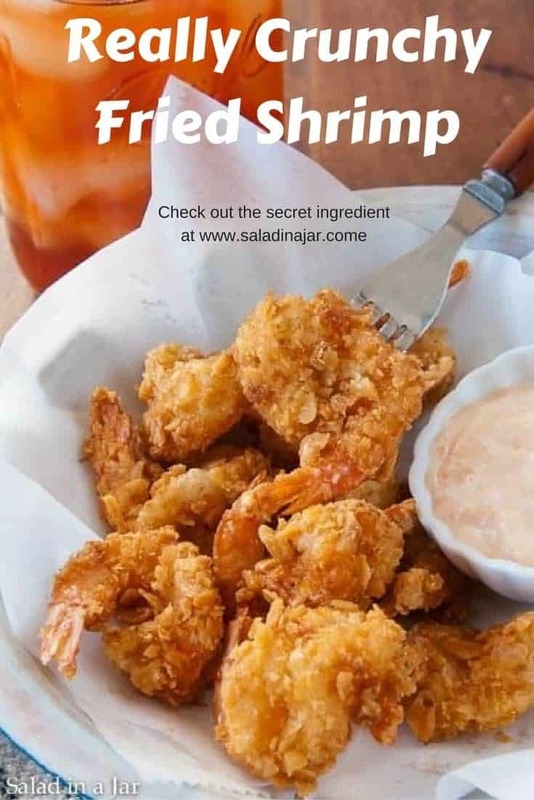 Really Crunchy Fried Shrimp is a simple fried shrimp with a crunchy coating. The secret ingredient may surprise you: ordinary saltine crackers! Fried food is an endangered species in my kitchen. Despite the ban on grease, these shrimp, specifically, are on the protected list. For some years now, we’ve followed a tradition of serving fried shrimp on New Year’s Day. Although I’m a person who loves change and variety, such traditions do make menu planning a little easier. Wouldn’t you agree? Because it’s pretty basic, I never thought about posting the recipe until my daughter-in-law requested it. As a result, this one’s for you, Susie. You’re only four steps away from yummy crunchy shrimp. Make that five. You definitely need to fry it. Serve with cocktail sauce or remoulade sauce. (See notes below for my no-recipe version of remoulade sauce). 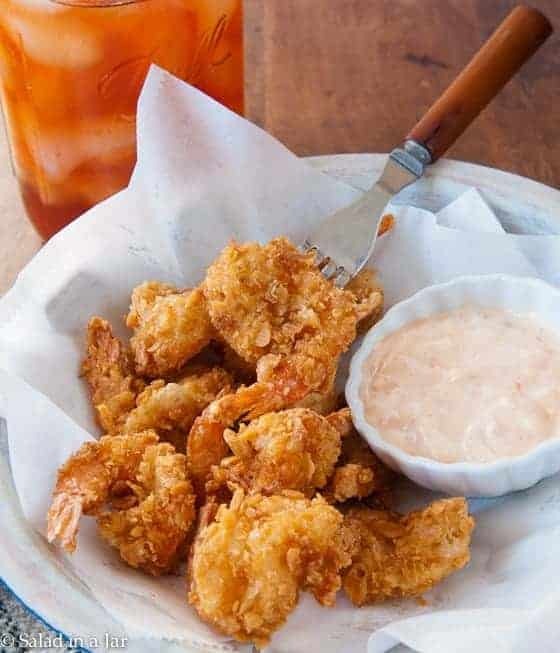 Simple fried shrimp with a crunchy coating. Combine first three ingredients and pour onto flat plate. Whisk eggs and milk together in a small bowl. Crush saltines and place onto another flat plate or shallow bowl. Remove shells and devein shrimp. You may leave the tails on...or not. Your choice. Butterfly each shrimp with a small sharp knife. 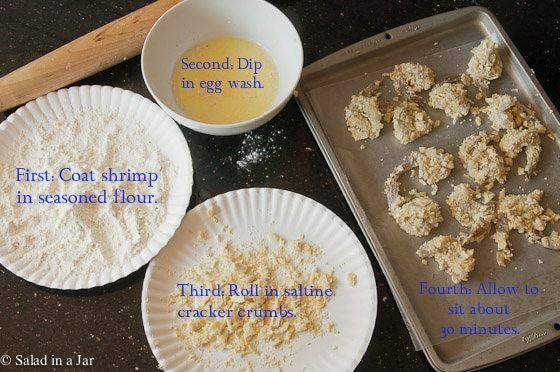 Roll each shrimp in seasoned flour, then dip in egg mixture, and finally, press shrimp into crumbs until covered. Be sure shrimp is butterflied (spread open) for maximum crumb retention which equals more crunchiness. Allow to sit on wax-paper covered cookie sheet for about 30 minutes. Fry in 3-4 inches of oil heated to 375 degrees until golden. It doesn't take long so stay close. Remove from grease and allow to drain onto paper towels. To approximately 1/2 cup mayonnaise, add enough catsup until it's nice and pink. Stir in a generous spoonful of pickle relish and one hardboiled egg, chopped finely. Please note that the calorie count does not include the oil the shrimp is fried in as that is impossible for me to measure accurately in my home kitchen. How. Many Carbohydrates are there in each, do you know? I just made this recipe with fresh off the boat Jumbo Gulf Shrimp. I didn’t fry enough! They were so good I wanted more than the 5 I fried for my lunch but I am quite full. They are so delicious and so crunchy. Can’t wait to cook them again this evening for hubby! I have searched a long time and tried so many fried shrimp recipes. No more searching, this is it!! Thanks so much! I forgot to ask. Have you tried this recipe with fish? Made this recipe tonight and it was the best shrimp we ever had! Thank you so much..this will definitely be a big favorite. Oh my god, this is the best recipe every, thank you for sharing with us. This recipe is awesome!!!! Absolutely restaurant quality recipe. …I will be making these at every event I host! !!! This is so smart! I’ve read about crusting sweet potato fries in crushed cornflakes, but that would definitely be a weird flavor on shrimp. Pinning to try! What’s not to love about succulent sweet shrimp deep fried with a crunchy salty cracker batter? I am going to use this for the Super Bowl. 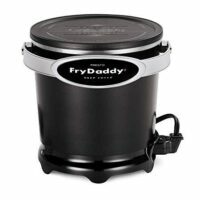 In fact I have this cute little deep fryer that will do the trick (cuisinart – not too expensive either) since I’ve been banned from deep frying on the stovetop by my husband because he claimes the grease goes everywhere. It doesn’t. But whatever. I don’t think he’ll complain much after this recipe, that’s for sure! Thanks Suzanne. You are so kind. Hope all is well with you. Might I suggest trying Rice flour instead of All Purpose. Gives a really good crunch on it’s own. I know I will be trying this recipe with Rice flour. I think I have some rice flour so I will try it. Making these for a Superbowl party so your suggestion came just in time. You certainly have a way of making my mouth water Paula! Reminds me of the shrimp I loved so much growing up but with 6 kids there was never quite enough to satisfy me! Six kids?? Are you, by any chance, an overachiever? 🙂 Even though I only had 2 boys they can never seem to get quite enough of these either on the rare occasion that I make them. This looks really good! I love fried shrimp but tend to hate that lackluster flour batter a lot of places use. I’ve seen a few recipes for crab cakes that use saltines to create a crust but I never thought of using them for fried shrimp. Definitely on my list of things to make. yum yum! Thanks for adding to the blog index…love this family favorite! Thanks so much for sharing! this recipe looks awesome! Oh these sound so yummy! Can’t wait to try them. I don’t have fried food very often either, but these look very tempting! Thanks for the recipe. Club crackers are the buttery secret to my perfectly crunchy Chicken Fried Chicken. I am sure that saltines are amazing on these shrimp. I can’t wait to try them.